When it seems like there is no more hope, we are closer to our hopes being fulfilled than we know. In this scene from 1 Chronicles, David is overcome with gratitude for all that God has done. He lived to see his son, Solomon become king. He saw the people bringing their gifts for the temple to finally be built. To see one’s legacy becoming fulfilled is a humbling experience, for sure. David could only stand and be amazed that God fulfilled His Word that had been spoken to Him. Hope fulfilled. But all that transpired beforehand and led to this moment was a lot of angst and endless hoping in the fray that we call life that David’s hope would be fulfilled. At times it looked impossible. Like David’s mishaps had removed all hope. But when God speaks and promises hope, He cannot be unfaithful to that promise. David acknowledged that without God, there is no hope—no purpose to our days underneath the sun. But when our hope is in God, we can know that His word never fails. When it seems like there is no hope, we are closer to our hopes being fulfilled than we know. What looks like an end is a segue or a new beginning with God. When our hope fades because of trials and suffering, we remember the story of David and other saints who grabbed a hold of God’s promises and did not let go. Their hope was higher than what they could see—their hope renewed because of their focus being on the author of all hope and not their circumstances. What is one way you renew your hope? How do you find hope when you cannot see it with your eyes? Leave a comment to be entered to receive a copy of 31 Days to Hope Reinvented. When we bring hope into someone else’s life, we might find our hope restored. If you have ever wondered whether or not sponsoring a child can make a difference, it does. An incredible one. 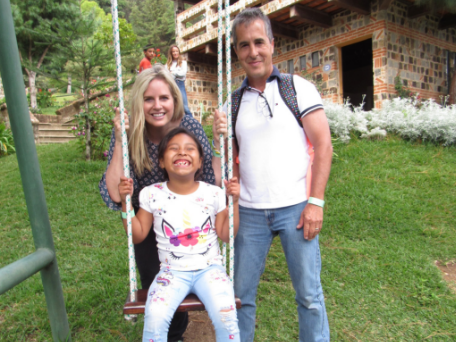 My husband and I got to travel to Guatemala last month to meet one of our sponsored children. A small sacrifice of $38/month completely changes their world – they receive an education, help to provide income, training, and a compassionate place to nurture their souls, as well, in a Christian setting. If you are interested in learning more, visit my page with Compassion International and help to rescue a child from the poverty of both soul and earthly provision.